Met Facilities were delighted to be shortlisted at the latest HFM European Services Awards. 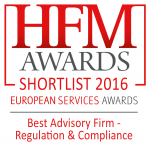 We were finalists in both ‘Best Regulatory Hosting Platform’ and ‘Best Advisory Firm – Regulation and Compliance’ categories. It is always rewarding to have our work and efforts recognised and it spurs us on to continually improve our services. It was also an honour to be held in high esteem amongst other high-calibre companies and market leaders in this space. A huge congratulations to the winners across all categories and a big thank you to HFM for organising the awards and to The Hurlingham Club for hosting the awards ceremony. Adam focuses on brand growth and development of the Group’s companies and, with regard to Met Facilities, drives all marketing, events and digital endeavours. He previously worked as an underwater photographer and writer across Asia for 6 years. Adam holds a Bsc in Accounting and Finance.